Thomie Jose San Agustin, MCSD It's Not a Bug. It's a Feature that make us a better Developer. 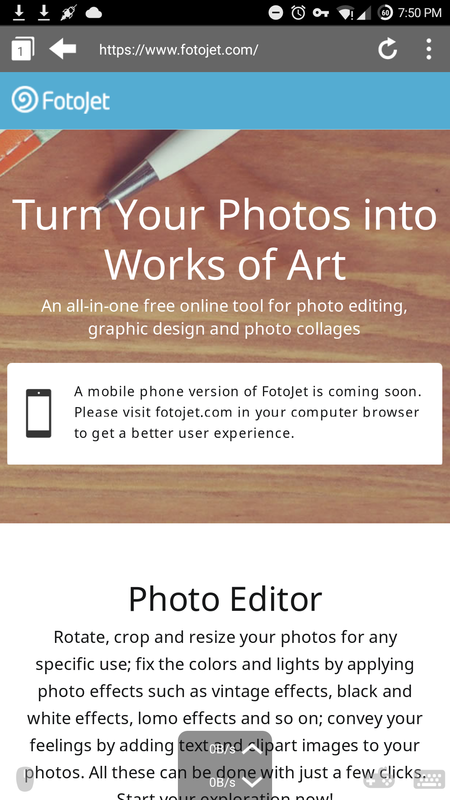 I was requested to review this tool called FotoJet. And what can I say is “Its worth it”. Let me tell you why with this technical review. The programming language used is Action Script i think because its running under the context of Adobe Flash Player. Even though they have mobile have which is very nice and we’ll review it on another session. If you want to use fotojet web make sure you are accessing it on a desktop because it is design for a desktop environment. Even though there is a browser that is capabale of running Adobe Flash Player like Puffin it is not designed to work on a mobile environment which it is detecting via the said screenshot. The ui is like you are using a desktop application which give a native app feel. It has inbuilt ui guided step by step to creage your wonderful collage. Its input just require your image to be browsed and all the design can be done via the web app itself. It has also inbuilt font but some of them need payment which is explainable due to copyright or agreements I think. In any case after building with the app I am satisfied with how easy it is to create one. Here are the samples I created that I loved much. A Microsoft Certified Solution Developer who is currently working as a Lead Developer at Winrock International with project ranging from ground-up web applications to creating data marts. He is also the Co-Founder and Core developer of icttech that caters projects from various clients. Recently he founded the LoadToCash that help individual convert their load to cash. Themed by Site5 WordPress Themes.